As a family-owned company, the company DESVOYS was founded 60 years ago. The agricultural equipment manufacturing activity is expanding continuously both in France and abroad. 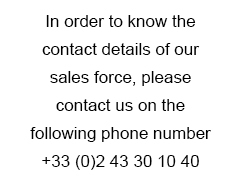 In order to know the geographic area and the contact details of our sales force, please contact us on the following phone number +33 (0)2 43 30 10 40.